Questions like Do I know enough? How do I prove myself when I’m new? and What exactly do I need to know? are common questions I get from people who are changing careers or want to start proofreading. Getting started is the biggest obstacle, regardless if you have zero or some professional experience under your belt. Add to that the job of “packaging” yourself onto a piece of paper to show prospective employers and clients, and it can be overwhelming. In this post, I’ll discuss what kind of resume you need to set up when you’re just taking the first steps into a new career, as a proofreader or in another field. This post contains affiliate links. Please read my disclaimer for more info. The best kind of resume to have when you’re just starting out with little or no experience behind you is to have a skills-based resume (aka functional resume). People often use this resume style when transitioning into another career, or don’t have a lot of professional experience in their new field. This is the best way to highlight your industry-related capabilities and proofreading skills as a newbie. It’s also an effective way to include experiences from aspects of your life besides previous jobs. Unlike the chronological jobs resume where you list companies you’ve worked for and what your responsibilities were, you can create a skills-based resume to focus on proofreading and your ability to work online. Look at your current and past employment positions. Are you a teacher? An administrative assistant? A nurse? What do you do in your current job that’s proofreading related? What about past jobs? Did you look over coworkers’ emails and internal communications? Do you draft memos, reports, or press releases? Almost every office environment has someone who’s the unofficial proofreader. Is that you? If you aren’t, then you can change that by letting people know you’re happy to proofread anything for them. For anyone who’s currently not in a paid working position like stay-at-home parents or students, look at what you do in your daily life or what you’ve done in your past working life that you can draw from. Have you volunteered to proofread anything recently? Do friends and family always ask you to proofread for them? If you’re working in a field that doesn’t involve any opportunities to work with content, then look at your personal life and past educational experience. Do you have a personal blog and proofread your own work? Or others’ work? You’ll start to notice that there are common skills everyone’s looking for. Those are the skills that you need to prioritize. If you’re looking to get into a particular niche like computer software, then make note of those necessary niche skills, as well. Gone are the days when you created one resume and sent it out along with a cover letter. These days your resume should be tailored to each job posting. You don’t have to start your resume from scratch each time, but you should customize it so that it addresses a job posting’s specific requirements. This Workopolis article has some great tips. After you list your name and contact info at the top of your resume you’ll have a profile section, where you write a couple lines about your objectives and strengths. You also want to infuse some personality into your writing. This is where you draw attention to specific achievements, practical skills, and accomplishments that can prove your competence as a proofreader and as a remote worker. Skills within these categories are valuable and transfer easily into the field of proofreading. If you can, tie these directly into an employment experience. Keep this section short by listing the name of the company, your job title, the location, and your period of employment. You don’t need to put in any bullet points describing your position and duties unless you performed tasks related to any of the above I mentioned. If you have any volunteer positions add them in this section, too (eg. you volunteer at your child’s school). I would add your blog/newsletter here if you have one. Here is where you mention your academic history (leave out high school), or any workshops or courses you’ve taken. If you’ve proofread before, add a list of projects you’ve worked on. You can also add any clubs/associations you belong to if you feel they could contribute to the position. Remember that you have to customize your resume for each job. As an example, say that you’re applying for a freelance proofreading position with a minimalist lifestyle website. Start drawing up your proofreading resume now, even if you feel you don’t have enough experience for one page. Just having your template there so you can start filling it in as you gain experience is kinda like adding clay to a sculpture and creating something you’re proud of. (Excuse my cheesy artsy metaphor.) Take a look at this sample skills-based resume. This exercise is a great motivator and confidence builder that’ll help you feel ready to enter the job market. Later, when you have more professional experience you can switch to a chronological or combination resume. 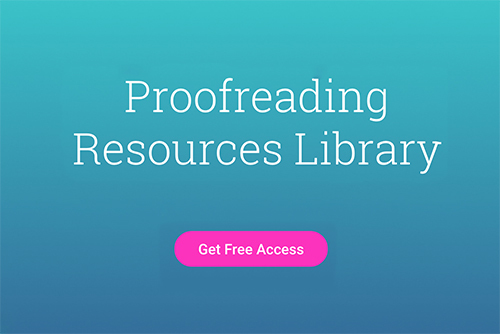 This information on resumes, plus more on how to start freelance proofreading, including how to set your rates and find clients, is in my ebook The Ultimate Guide to Freelance Proofreading: A Step-By-Step Guide To Working For Yourself. Wow, this is really great. Thanks for all the info you share on your site, Phon. Good stuff.